If you ever watched TV in the late '80s and '90s, especially in the greater NYC area, you've probably seen a commercial with some orchestrated music about some nerds dancing around in skintight cat suits. Cats was a smash hit on the stage and the longest running Broadway show at one time. It's since been bested by another cat play, The Lion King; Chicago, which is about Richard Gere and fishnet stockings if I remember correctly; and The Phantom of the Opera, a play about a goth who lives in a sewer and obsesses over some chick who's grossed out by him. Recently, probably because more reboots and adaptations are being developed in Hollywood than ever before, it's been announced that a Cats movie adaptation is in the works. And details on the film reveals it's utterly psychotic. One of the weirdest pieces of news regarding the musical is that the actors won't be rocking the leotards and unitards lifted straight from a Jazzercise class. 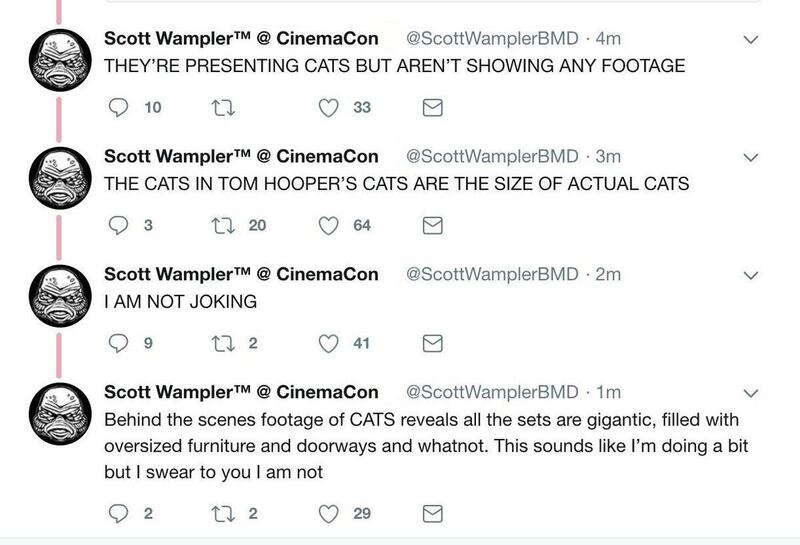 Instead, they'll be transformed into CGI cats. 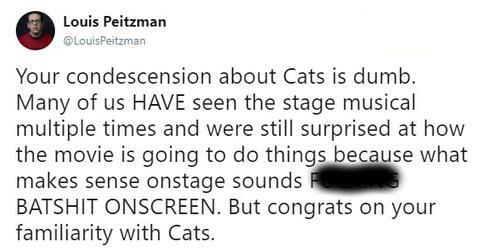 And those cats will be cat-sized, not the giant furries that sang and tumbled about on stage during the old-school production. The film will be directed by Tom Hooper, who was the man responsible for 2012's Les Miserables. The movie earned Anne Hathaway an Oscar for her amazing rendition of "I Dreamed a Dream" which resulted in one of the most unsavory acceptance speeches of all time. It also featured Hugh Jackman as the largest man in France. Seriously, he was comically large. I thought they were going through a depression and no one had any food to eat, yet this boat prisoner is somehow getting his hands on 280 grams of high-quality protein a day? Get real. Despite the questionable premise of this film, tons of people are excited about it. Mostly because of its stellar cast. I mean absolutely stellar. Taylor Swift, Rebel Wilson, Idris Elba, Jennifer Hudson, Jason Derulo (get jazzy on it) Ian McKellen, James Corden, Judi Dench, and Ray Winstone round out a ridiculously stacked cast. 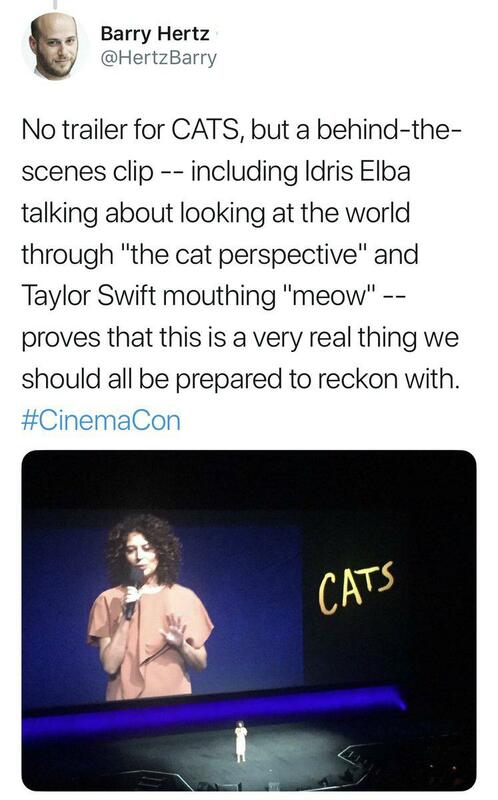 Even though the characters are going to be CGI, cat-sized cats in the film, it turns out that all of the actors are going to have their movements, dance moves, and everything else motion-captured and applied to their CGI avatars. In fact, many are calling the movie Tom Hooper's Avatar. Except, not with a bunch of weird blue alien cat things that are metaphors for the injustices European invaders subjected Native Americans to. So kinda different. After learning more about the film, some fans of the Cats story, which is originally based on a work by T.S. Eliot, are wondering why they're even referencing the play, since so much of it has been obviously changed/re-imagined for the upcoming movie. 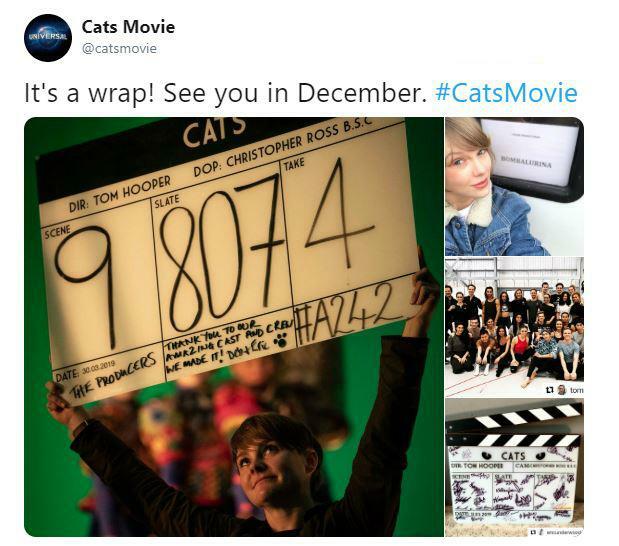 Shooting for the film has officially wrapped, and sneak peaks, while they haven't revealed what the CGI cats in the movie will actually look like (shooting the actors in a movie so CGI-heavy is probably one of the easiest things production will have to worry about), have revealed some interesting tidbits about the film that fans just can't get over. The sets are comprised of oversized furniture. The "sizzle reel" shown to press included interview clips from all the actors talking about their time on set and what it was like filming this absolutely insane movie. 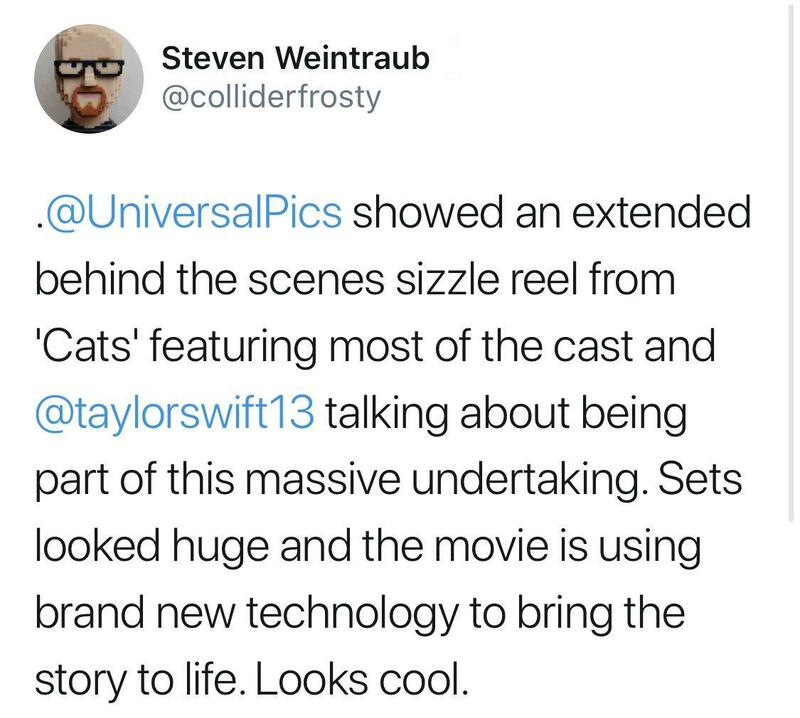 Other details about the film emerged as well, like the fact that Taylor Swift is going to be doing a lot of singing, which is to be expected — she is a musician, after all. What, did you just think she was famous for venting about fast failed relationships? She's reportedly going to sharing a duet with Pitch Perfect's Rebel Wilson and will have a solo all to herself. 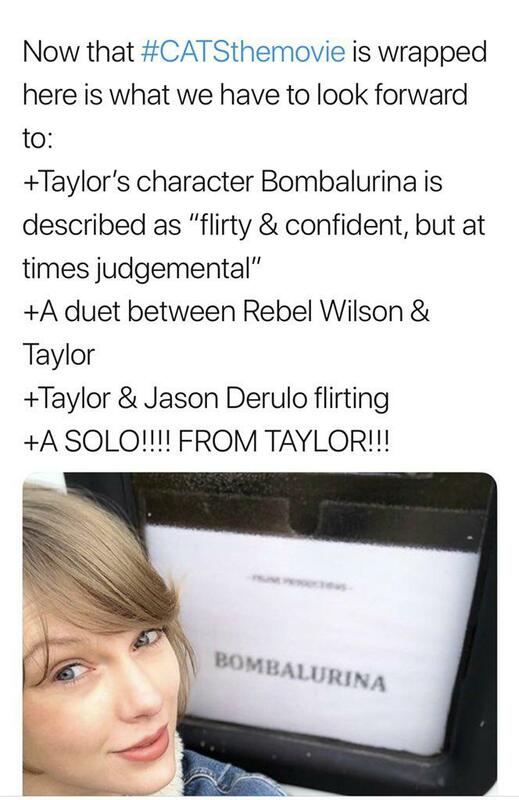 Oh, and Tay Tay and Derulo are apparently going to have a thing for one another. 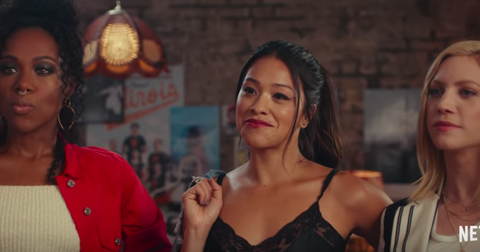 While there's been a lot of genuine excitement surrounding the release of the film and Hooper's delightfully Kubla-Khan-esque vision for the on-screen adaption, there are a number of people who can't stop making fun of how ridiculous it sounds. It doesn't help that Cats is such an easy target, either. Tons of people are scratching their heads at how the studio opted to get people stoked about the film. Having Taylor Swift mouth "meow" on camera? 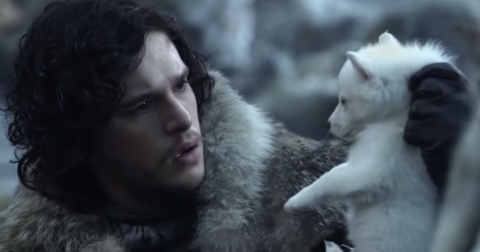 Some are calling the movie a "fever dream," especially at the mention of "digital fur technology." That's right, a whole new technology was cooked up just to better animate the fur in this film. As impressive as the technology and all of the hullaballoo surrounding it is, there are Cats devotees who really aren't having anything to do with the news of this film. A lot of people were excited, however, when Jennifer Hudson sang "Memory" at the behind-the-scenes presentation. So what do you think? Will this be a beautifully stupid commercial success like Les Miserables? 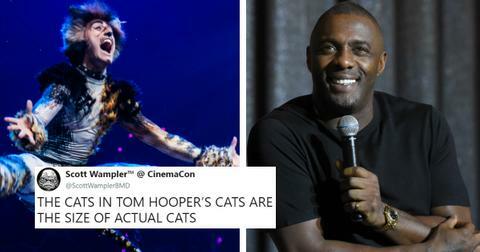 Or will Cats not translate to the silver screen?